One day on my walk I can’t see because it’s so humid outside the sweat is dripping off my brow into my eyes. The next I’m contemplating turning the heat on because it’s so chilly. Welcome to September in Vermont, one day you can’t breath it’s so hot, and the next you’re digging around for a sweater and turning on the oven to warm the kitchen! In full admission, this recipe is a total knockoff of something I saw in the vegetable section of the supermarket one night after work. Big portobello mushrooms made into pizzas! I thought what a smart idea, then decided to make my own healthier version one chilly night. Helpful Kitchen Tip: I made my sauce from a low-salt tomato sauce because I wanted something a bit lighter than regular spaghetti sauce (I also didn’t have any at home). But if you have that on hand, by all means use it and ignore the instructions to make the sauce. These are so easy, and a gluten- and carb-free way of making pizza. And it’s perfect on those nights you want a light dinner. I served it with some sautéed Swiss chard and a salad, but thought some grilled polenta on the side would be equally perfect. While I added onions to this, play around with whatever toppings you like on your own pizza! 2. In a small bowl, add the tomato sauce, and oregano, basil, salt, and pepper to taste. 3. Take each mushroom, remove the stem, and with a small spoon, carefully scrape the gills to remove and place them in a baking dish, bottom side facing up. 4. Spoon a little bit of tomato sauce on to each mushroom. Add a little bit of the chopped onion or your toppings of choice. Top with cheese and sprinkle some additional oregano and/or crushed red pepper on top. Cook for 15-20 minutes, or until the cheese is bubbly. It looks delicious. I like that it has only few ingredients and it is fast to make. Perfect weekday meal! Oh, this looks sooooo good. I’m going to try this. I often make portebella “burgers” but this is a whole other take on them…looks delicious! 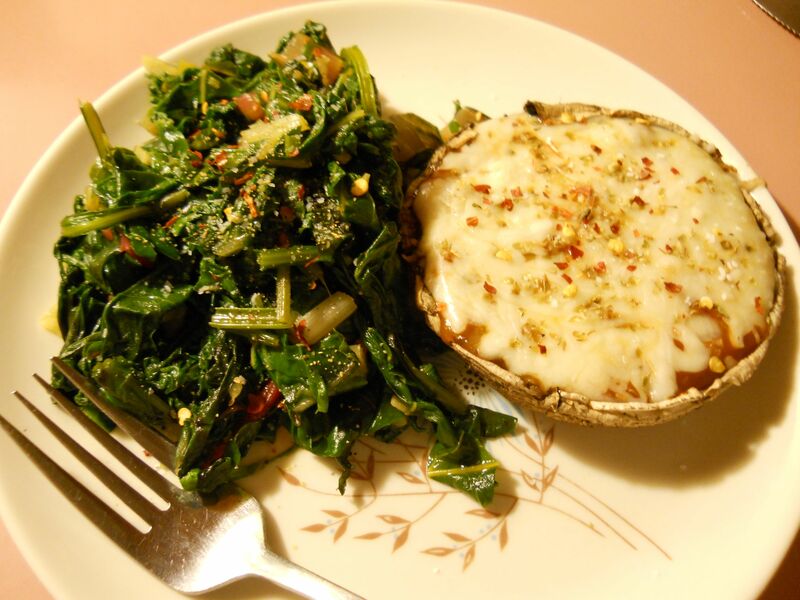 Hi Chris, I’ve never had a portobello pizza but I do love cooking with portobello. Thanks for the recipe and idea, I’m going to give it a try sometime soon, perhaps for dinner on Friday. :) I also want to let you know that you won the surprise give-away. :) I’m sorry for not getting around to posting about the drawing on the 10th. My laptop screen was down for a couple days and after replacing it, i finally got around to posting on Friday. So Congratulations! You won the gift=package giveaway! :) I wrote the details on the post and will try to get the package to you asap. Have a great week, take care!